Let’s face it, your child’s math homework probably looks nothing like the math you remember from your elementary years. I’ve been through a couple of years of elementary math and I’ve seen many assignments that left me scratching my head. Ack. What’s a parent to do? If you’re lucky, your child’s school is supporting you and helping you understand these new math techniques. But, if you’re not, you’re left trying to fend for yourself. It’s frustrating. I get it. Go ahead. Scream. Curse Common Core, if you like. But, at the end of the day, your kid needs your help. I’ve spent a lot of time figuring things out. Call me crazy, but this new way to do math is kind of fun. (And, I wish I had learned math this way!) I’m going to share what I’ve learned and give you activities to do at home. We’ll have fun, trust me. Even better… you’ll be a champ at helping your kids with their homework! You can find all the posts in this series linked below. 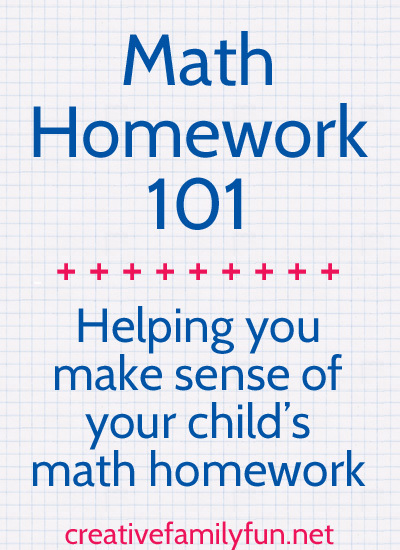 You’ll find tutorials and helpful information on the posts labeled Math Homework 101. The other posts are fun activities you can do at home to reinforce a math concept.